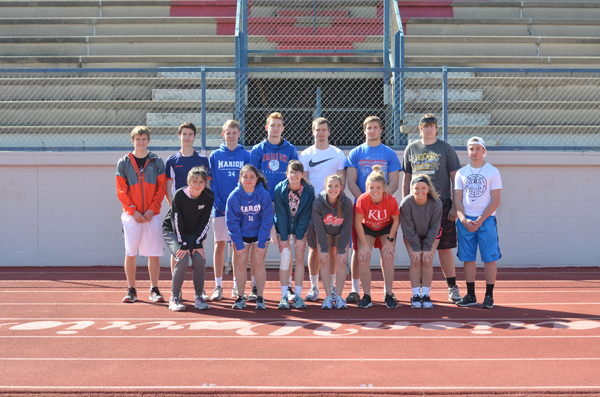 These seniors and returning letter-winners will anchor the Marion track and field team: front row (from left), Sabina Abuzarova, Elisa Barba Ortiz, Meggan Frese, Sam Richmond, Jessi Lewman, Courtney Herzet; back row, Colin Williams, Diego Ruiz Clemares, Juri Billerbeck, Zachary Stuchlik, Jack Schneider, Tyler Palic, Antone Vinduska, Austin Neufeld. The Marion track and field team will compete in a new classification this year, dropping from Class 3A to 2A this season as the Warriors seek to build on last year’s successes. Marion qualified seven athletes for the 3A state track meet a year ago and brought home seven medals, including one gold. Four of those state qualifiers return, leaving 19th-year head coach Grant Thierolf excited for the year ahead. Last year, the Marion boys won the Heart of America title and finished eighth as a team at state. Headlining Marion’s list of four returning state qualifiers is senior Tyler Palic, the reigning 3A discus champion. 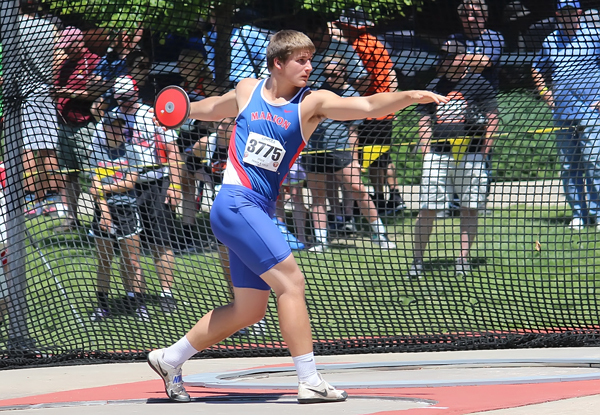 Palic’s throw of 175 feet, 11 inches was more than 20 feet beyond second place. Only Tonganoxie’s LeeRoi Johnson in 4A threw farther than Palic that day (180-3). Palic qualified for state in the shot put, too, placing sixth with a personal-best throw of 48-51⁄2. This year, Thierolf said it’s realistic Palic could qualify in all three throws, although discus and shot put will remain Palic’s focus. Palic’s top mark in the javelin last year was 149-11. Senior Jack Schneider will anchor the sprinters. Schneider enters the track season healthy for the first time since eighth grade, Thierolf said. Last year, Schneider underwent surgery after sustaining a knee injury, but was still able to compete in track. Individually, Schneider was third at state in the 200 (22.51 seconds). He has run the 100 in 11.02 and the 400 in 51.82. Schneider anchored the sixth-place 4×400-meter relay (3:32.04) with teammates Tyler Arocha, Zachary Stuchlik and Colin Williams. The latter two return for their senior seasons as well. Individually, Stuchlik will lead the jumpers, competing in the triple jump and the long jump, where he has recorded marks of 39-0 and 19-0, respectively. For Stuchlik, making it to state will require consistency, Thierolf said. Meanwhile, Williams qualified for state in the 800 and the 1,600 a year ago. He placed eighth in the 1,600 in a personal-best 4:40.22 and 16th in the 800 (2:25.10). Williams’ best time in the 800 was 2:07.8. Thierolf said after last year’s meet that Williams had saved energy in the 800 in order to be ready for the 4×400. Williams’ goal this year is to place higher on the podium, Thierolf said, which will require additional training. Junior Noah Dalrymple is another returner in the jumps. His 2017 top marks are 5-10 in the high jump, 38-9 in the triple jump and 18-5 in the long jump. With the graduation of Bryce Shults, who qualified for state in the pole vault a year ago, senior Austin Neufeld returns to lead the event. Neufeld’s top jump last year was 12-6. Look for Colton Mercer, a junior, to contribute in the 4×400 as well as some open events. His best marks are 2:12.4 (800) and 5:07.2 (1,600). Senior Antone Vinduska joins the team for the first time as a thrower. Additional contributors are: seniors Juri Billerbeck (jumps/sprints) and Diego Ruiz Clemares (sprints); and freshmen Austin Ebaben (jumps), Nathan Shields (distance) and Forrest Slater (distance). Of the 25 girls out for track, several upperclassmen return to lead the team. Marion’s sole state qualifier last season, Marissa Jacobson, has graduated. Senior Sam Richmond, however, was one place away from qualifying for state in the 400. She will be looked to for leadership this season. Senior Meggan Frese will anchor Marion’s distance runners. She has recorded times of 6:18.6 (1,600) and 13:18.1 (3,200). Leading the throwers are seniors Courtney Herzet and Jessi Lewman. Herzet’s 2017 marks are: 93-10 (javelin), 88-7 (discus) and 25-10 (shot put). Lewman, meanwhile, has thrown 88-7 in the javelin. Junior Emmy Hess is Marion’s top returning jumper and hurdler. She ran 17.2 in the 100 hurdles, and has marks of 15-8 in the long jump and 32-6 in the triple jump. Junior Michaela Regnier returns in the pole vault this season. She has cleared 8-7. The vaulting corps also includes middle school record-setter Anne Baliel, a freshman, and sophomore Grace Winter. Baliel will also compete in the sprints. Senior Sam Kelsey will compete in the long jump (15-9) and the 400 (1:04.7), after not going out for track last year. Junior Bethany Grim­mett will run the 3,200 (15:36.9), while junior Maria Stuchlik will run the longer sprints and contribute in the relays. Additional contributors are seniors Sabina Abuza­rova (jumps) and Elisa Barba Ortiz (distance); sophomores Emily Hutchin­son (sprints), Alfweena Meyer (sprints, jumps), Jaimee Wickman (sprints, jumps) and Shelby Cairns (jumps); and freshmen Abigail Stuchlik (jumps, sprints, relays), Tristan Williams (distance) and Preston Schneider (sprints).